Incorporating was my mom's idea. She's the one that took care of it all paper-work wise. She was concerned about potential lawsuits and being incorporated would (in theory but not so much in practice) provide some legal protection. The other benefit is that it gave a better impression to IBM. IBM? Well yea, you see, in 1993 I was working on an OS/2 game. The first "major" commercial OS/2 game called Galactic Civilizations. I was doing it from my dorm (and later apartment) at WMU. I started doing it with GNU CPP since it was free -- I couldn't afford any real tools. But a group at IBM was pissed off at Microsoft over the "betrayal" of Windows 3.0 and they were determined to make OS/2 compete head to head with Windows. That meant OS/2 needed games and since mine was the only significant one in development, they helped me out. Not with money mind you but they sent software, compilers, documentation, etc. But when IBM management started getting more serious, they looked for my "D&B" listing (Dun & Bradstreet"). There was none. And having the company be a DBA "Doing Business As" which is what I'd been working as wasn't going to cut it. So Stardock Systems became Stardock Systems, Inc.
My friends Andy Arvanitis and Chris Dailey helped me out on programming issues on Galactic Civilizations. My knowledge of OS/2 programming let alone C programming was pitiful. I had 2 books: "Teach Yourself C in 21 days" and "OS/2 2.0 Presentation Manager Programming". If it weren't in those two books it wasn't in the game. So what does that mean? Well in GalCiv, every ship, star, planet, etc. was actually a window of style SS_ICON. My books didn't cover how to do graphics programming but they did show how to create a window and put a picture on it. So GalCiv probably has the record for the program with the most windows in it -- several THOUSAND (let me put it this way, a typical program may have 4 windows in it total). For artwork in the game itself, such as the aliens, my friend Bill Zalenski provided that. In 1994 I got my first hard business lesson -- contracts are only as powerful as the legal force behind you. Galactic Civilizations was released for OS/2. It got great reviews. It allegedly sold very well. I say allegedly because Stardock never got paid for a single retail copy of it. The "publisher", it turned out, was essentially a 1 guy operation who didn't know what he was doing and simply didn't pay any royalties even though we (And I'm using the "royal" we at this point) were entitled to 50% of the gross revenue. So Stardock almost died before it really got started. "Why didn't you just sue the publisher?" No money. You can always tell someone who has never dealt with the legal system -- they're the ones who threaten to sue people or who think the courts are a magical place of speedy justice. The publisher was in Utah. I was in Michigan. It would have cost a fortune and 1) I had no money since I hadn't been paid any royalties and 2) Odds are he had spent the money already. But I wasn't out yet. I made an expansion pack called "Shipyards". It sold for $15 and we sold roughly a thousand of them. With that $15,000 I paid my friends who had helped me out. When I was done, I still had around $3000 left. Hindsight often makes it clear which path was the way to go. But in 1994 having gone through quite a bit of pain it was very tempting to just pocket the $3000, have a good story to tell friends and just go out and get a job. My saner friends decided to do just that and so from 1994 on I was on my own other than my brand new wife who has always been incredibly supportive. OS/2 Essentials was basically a suite of OS/2 shareware utilities that were the full versions of the shareware. It sold for something like $39.95 and because of the fame from Galactic Civilizations, I was able to get it into retail. It didn't sell great by today's terms but that $3000 investment multiplied by several times. Moreover, it showed that we weren't a one trick pony. It attracted the attention of the person I consider even today to be the best OS/2 software developer of all time - Kurt Westerfeld. He was working on something called "The Workplace Toolset/2". He saw how popular GalCiv was and that OS/2 Essentials was at retail. We combined our talents together, rechristened his program as "Object Desktop" and rounded out features together to make it a more mainstream program. Meanwhile, IBM was putting together something called the IBM Family FunPak. This was basically a bundle of OS/2 games. A friend of mine at IBM, Mike McNutt, let me in on how much they were paying to license OS/2 games. IBM was interested in Galactic Civilizations. But because of the royalty issue, I told them that game wasn't really available. But I told them of a "new" game we were working on called "Star Emperor". Star Emperor was basically GalCiv with a simplified rule set. I just had to rewrite the AI over a few days and make a few other changes. The whole thing was done in a week or so and IBM paid handsomely to license it. So now we had a bunch of money we could use to market our stuff. 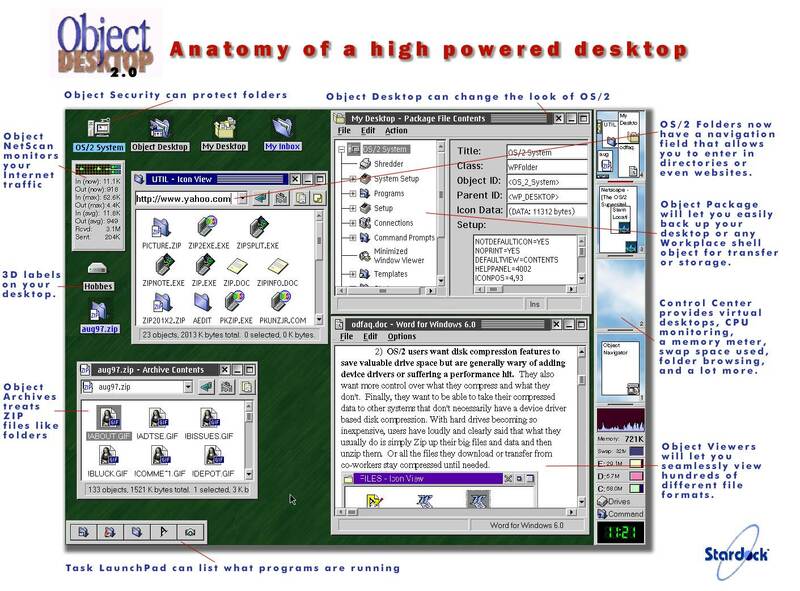 When Object Desktop was developed (1993-1995) it was competing against Windows 3.1. 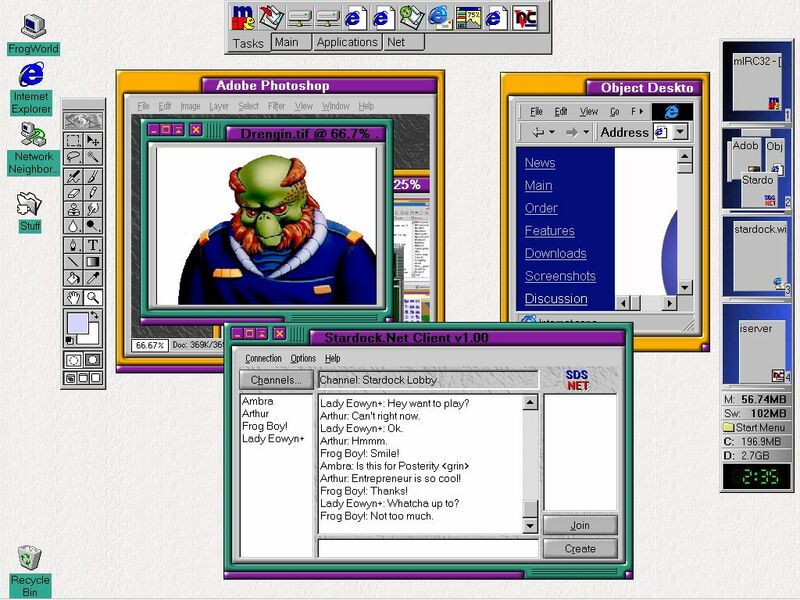 Compare how Windows 3.1 looked to that screenshot here. You can see just how far ahead Object Desktop was ahead of its time. Heck, look at the screenshots of Longhorn and then look again at the screenshot from 1994. Later in '95, because of non-payment on royalties, we got the rights to GalCiv back and late in 1995 released Galactic Civilizations II. In 1995 Stardock had its first 5 full time employees. These employees were manning the phones, running tech support, and working on the next game which would be called "Entrepreneur". 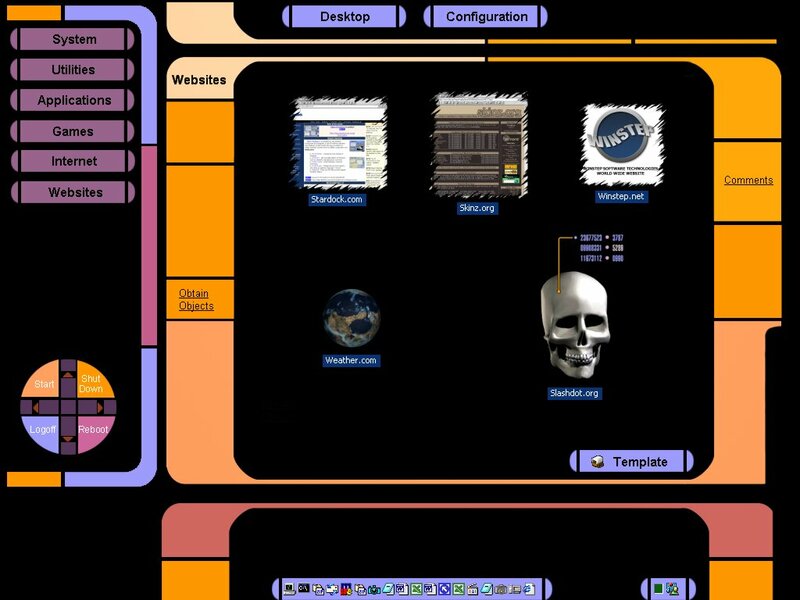 It was the high point of Stardock's OS/2 existence. Flush with cash but with no business experience we were well prepared to run the company into the ground. Obviously we didn't know we were doing that at the time. But we were blinded by our OS/2 zealotry. We believed IBM's assurances that they were committed to OS/2. What we didn't know is that Lou Gerstner, CEO of IBM had quietly killed it at the end of 1995 when OS/2 for the PowerPC failed to be released by Fall Comdex '95. We also released other products such as Trials of Battle, Process Commander, as well as Object Desktop Pro which included a powerful but expensive set of file viewers. But OS/2 was already dead. We just didn't know it. You see, Microsoft had released Windows NT 4.0 and within months, the core user base of OS/2 was gone. We were starting to get the idea that something had gone wrong by 1997. Sales on all our software had dropped massively. We eventually figured out that it was Windows NT 4.0. We released more OS/2 programs including the OS/2 version of Links Golf and PMINews. Watching our revenue drop, I felt like a total fraud when I was featured in Entrepreneur Magazine as one of the "hot young tech executives" that June. When they asked about our next game, I told them "Funny you should ask, our next game is actually called 'Entrepreneur'." The reporter thought that was cool. But it wouldn't be the last we hard from them about the name "Entrepreneur". This is when things came to their low point. Ever done a net worth graph in Quicken or Quickbooks? This is when it went to less than zero. I am pleased to say that we never missed a payroll nor did we ever not pay a developer a royalty. And we did it all on time. But we were laying off employees. Which was really painful because like many naive, dumb start-ups, I had hired a lot of personal friends of mine to join the company. You can imagine how well this went over in having to lay your friends off. But the man of the hour was a young developer/artists named Mike Duffy. Today, Mike works on Jimmy Neutron. But in 1998, he happened to be at Stardock. Why was he the man of the hour? Because for some crazy reason, as lead developer of Entrepreneur he decided to make a gaming library called Pear that happened to work on OS/2 and Windows. This meant that when Entrepreneur was done, it would run on Windows as well. This also meant that Stardock could have a game at retail that ran on Windows and OS/2 at the same time. Entrepreneur was loosely based on the business tactics of a certain very aggressive and large software company. The object of the game was to become a monopoly in the market you were in by crushing your competitors through a combination of distribution, technological superiority, and a lot of marketing. Even "FUD" units were in the game (Fear, Uncertainty and Doubt). The game did pretty well selling something like 75,000 copies worldwide (though in fairness, 40,000 of them were sold at less than $10 apiece). But it was enough to bide us time with what developers we had left to focus on bringing Object Desktop to Windows. In 1998, we had begun working with some new friends we had met via the Internet. Three in particular stood out: Andy Satori, Neil Banfield, and Brian Harper. 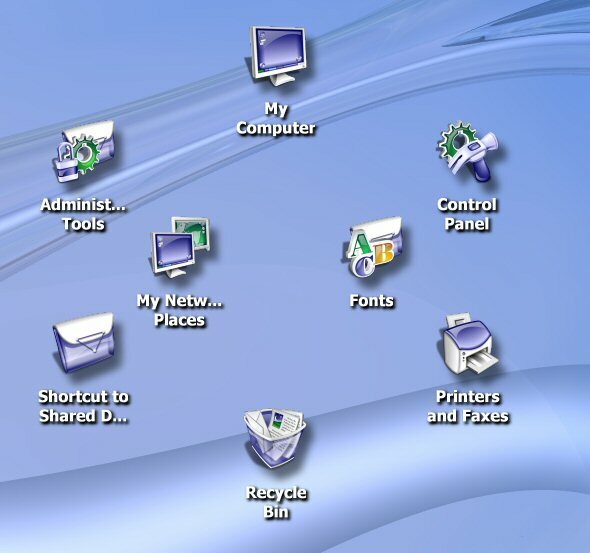 Together, along with internal developers, Object Desktop was being reborn on Windows. 3 key parts of Object Desktop were in their hands: ControlCenter, WindowBlinds, and IconPackager. But what saved us was customer loyalty. We decided that since we were going to be developing desktop enhancements on Windows that we would have to be constantly releasing new updates to keep up with changes to the OS. So Alexander Antoniades, who had founded Game Developer Magazine and was our VP of Marketing, came up with the idea of selling software as a service via a subscription. This would become our .NET initiative. And our customers purchased Object Desktop subscriptions sight unseen. They trusted us from our OS/2 days to "make good" and it was with their support that we were able to finish it. But there was a wrinkle. Remember Entrepreneur Magazine? They filed a lawsuit against us over our use of the name "Entrepreneur". I was appalled by the whole thing but they had a lot of cash ready to spend on making a lawsuit against us as painful as possible. We eventually settled and our sequels have used other names. But the entire experience taught me a great deal about intellectual property law and just how tenuous intellectual property rights really are. It also put a big damper on our game side that would last for years. 1999 was the turning point for Stardock but it almost didn't happen. The Dot-Com explosion had come up and we were quickly eclipsed in terms of "Buzz" by a slew of start-ups who had millions of dollars in venture capital. In May 1999 an Internet start-up called Neoplanet invited me down to Arizona. They were interested in hiring me and the WindowBlinds team to become part of Neoplanet. They offered lots of stock options which they assured me would be worth millions one day. But as I stood there in their beautiful building, I just couldn't get over the fact that there didn't seem to be a business model that could generate any significant amount of money. While I was there, I got a T-shirt which celebrated their 1 millionth download. Not paying customers. Just downloads. It was a close call. Stardock wasn't recovered from the OS/2 market by a long stretch. It was tempting to be part of a wealthy organization with lots of fun smart people. But in the end Stardock remained. 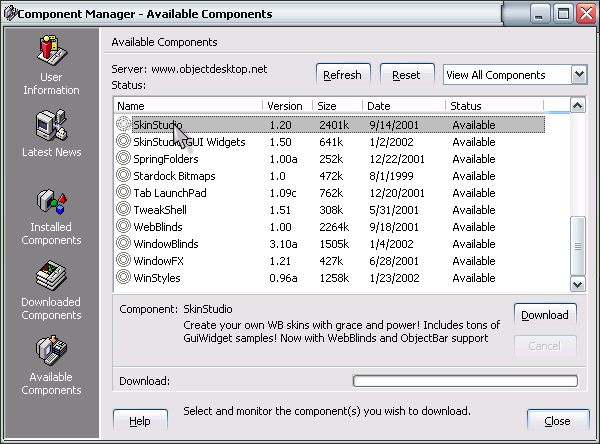 In December, The Object Desktop Network (ObjectDesktop.net) was officially launched. Things were really looking up by 2000. Object Desktop was a hit. We had just finished the Starcraft add-on "Starcraft Retribution" and one of the Object Desktop components, WindowBlinds, had really taken off. Which was amazing because WindowBlinds on Windows 95, 98 and ME barely worked back then. Despite the problems, WindowBlinds was incredibly popular. It helped launch a program called WindowFX as well. WindowFX was the first program that added truly alpha blended shadows under windows this was long before MacOS X hit the streets. We also came out with DesktopX. 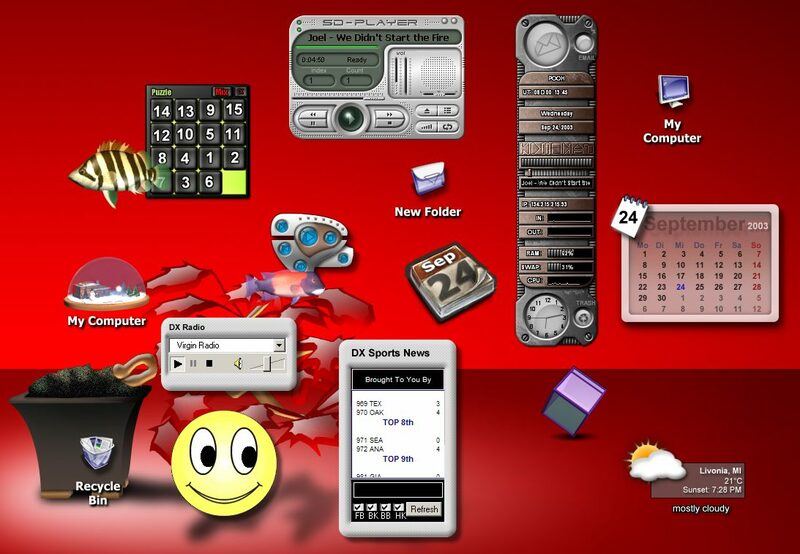 DesktopX allowed users to put real objects on the Windows desktop. Yea, we've never managed to get the marketing message cleaned up so that people recognize just how cool DesktopX is. Basically when it boils down to is that you can build your own desktop out of objects. So if you had your own ideas on how the computer should look and feel, you could create them with DesktopX. It introduced the concept of "zoomers" (think of icons that grew when you put your mouse over them -- again, before MacOS X came out). In 2001 the Dot-Com era came down with a crash. People today try to blame Clinton or Bush for the recession. Think again. A couple trillion (that's with a T) dollars in investments disappeared with those dot-coms. And with that investment and capital went millions of jobs and the economy with it. None of this had much affected Stardock though. That's because we had been left out. We've never received any venture capital. And our customers were end users mainly or established corporations. But there was a side effect: The skin sites were going down. Skin sites? Our Object Desktop programs allow you to download user-created "themes" for them. Skins, icons, wallpapers, etc. created by users were uploaded to websites that hosted them. Hence the name "Skin sites". The problem with these sites is that they relied on ad revenue from banner ads to fund them. A skin site is very expensive to run since they are, effectively, little more than huge download repositories. As the skin sites went down, so did our business because our users couldn't download skins for our software, they didn't have as much an incentive to buy our software. So we launched WinCustomize.com, a new skin site. We included not just skins for our stuff but skin sections for other programs including our competitors. Our view was a rising tide lifts all boats. The big unknown was the release of Windows XP. Windows XP included its own "skinning" system that while very limited was "free" (in the sense that its cost was factored into your purchase of Windows XP). We weren't sure how this would affect us. Microsoft implemented a security system to ensure that third parties didn't make their own themes -- only Microsoft digitally signed themes could be used. But like many security systems, it was cracked and techies were making their own "visual styles" for Windows XP. By 2002, it had become clear that Windows XP was helping WindowBlinds. Sales skyrocketed as users exposed to the basic skinning in Windows XP wanted something more. Because XP was designed for desktop customization, our software worked better than ever sales grew across the board. We concluded that we were now fully armed and operational. It was time to go back and try to do a Galactic Civilizations for Windows. We wanted to do it right so we put together a budget of around $600,000 (which was a lot for us) to create it. We were also finally getting mainstream attention with companies like Microsoft, Nintendo, nVidia, and dozens of others were licensing our software for their own use. Movie and TV studios were beginning to use our software to put together those "Fake" computer interfaces we always groan about when you see them on TV. In business terms, the company had reached that positive feedback loop. The positive feedback looped allowed us to grow in terms of new hires. At the low-point in 1998, our company was down to 3 full time employees. By 2003, we had grown to nearly 30 people working on various projects around the world. Galactic Civilizations came out and received editor's choice awards from 2 of the 3 magazines and the average review rating of the 50 or so magazine reviews was between 4 and 5 stars. Microsoft licensed our software to create an Xbox visual style, an Age of Mythology visual style and visual styles for some of their other games. Warner Bros. did the same thing to create a visual style for Terminator 3. Skinning, as a market, had grown big enough that there are now companies making a good business creating skins for third parties such as Pixtudio and The Skins Factory (amongst others). 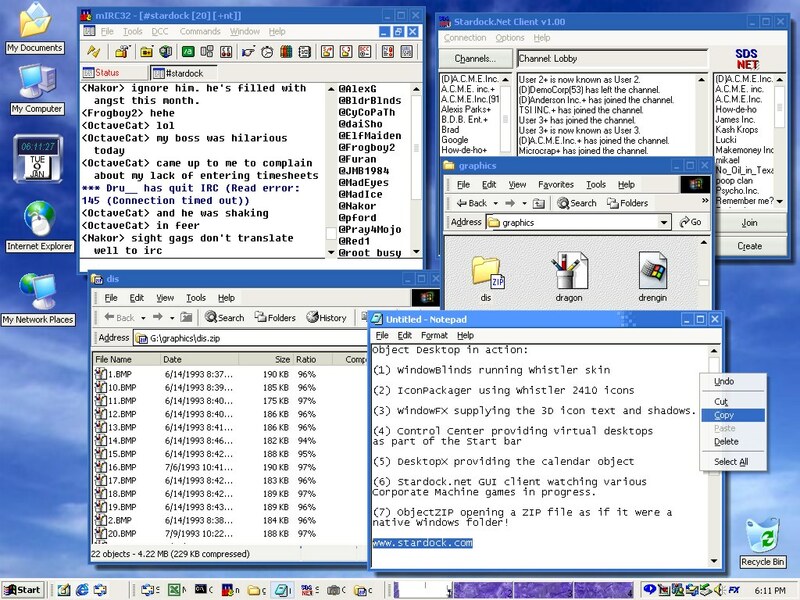 In late 2002 we had begun to rework the entire Object Desktop line to put together Object Desktop 2004 for a late 2003 release. The goal to bring a new level of polish and quality to the Object Desktop components. The first release for this was WindowBlinds 4 and has been followed up with Stardock Central, a program that lets users get updates, visit forums, check docks, chat, and more from a single UI. We've been also struggling to re-do ObjectBar, a program that was meant to be a kind of GUI erector set but has always had trouble finding the right balance between power and ease of use. We're hoping to get ObjectBar 2.0 out this year. Another big release was WinStyles Theme Manager which finally has a UI that should be pretty straight forward to users. It's already been licensed by other companies for applying themes. And the second generation of DesktopX is ready to go too. There's all sorts of cool stuff in the lab. We have two new games in development right now. One is called The Political Machine, a strategy game where you run for President as well as a future sequel for Galactic Civilizations which won't be out any time soon. We also are working on something we call an Information Environment. Where Object Desktop is about customizing the Windows environment to suit your needs, our Information Environment, called ThinkDesk, is designed to let users make use of their "stuff" in a more productive manner. It won't be out for a bit either and we rely on a lot of technology in Longhorn so ThinkDesk will almost certainly require at least Windows XP to function. We, like other companies, are recognizing the importance of blogging. What's a blog? Well there are lots of definitions but here's mine: Blogging is about regular people being able to share their views about things with the world. I personally like the term "Indie Editiorials" since in many ways, that's what they are. So we're putting a lot of effort into JoeUser.com. A lot of pretty fantastic IT technology is being created along the way that we hope to roll into our other websites to provide more goodies for our WinCustomize, Object Desktop, and Drengin.net users. It's been a crazy journey. This whole thing was just an accident in many respects. When I was nominated for Ernst & Young Michigan Entrepreneur of the Year, I met a lot of other "entrepreneurs". Each has its unique story. Ours, though, I truly believe is one of the more unique stories. I mean, really, what is Stardock ultimately? It's a bunch of guys who hang out creating really cool stuff. Heck, we make PC video games and then turn around and make desktop customization software. Talk about totally unrelated. It's no wonder we've never gotten venture capital. A friend of mine commented that Stardock is really a really profitable hobby. Who knows what the next 10 years will bring. The first 10 years brought triumph and near bankruptcy and then back to big growth again. If we're around 10 years from now, and I suspect we will be, who knows what adventures we'll have gone on between now and then. Whether for good or ill, it's always exciting and all in fun, it's been a fun ride. Brad Wardell is the founder of Stardock Corporation. You can email him at bwardell at stardock.com.